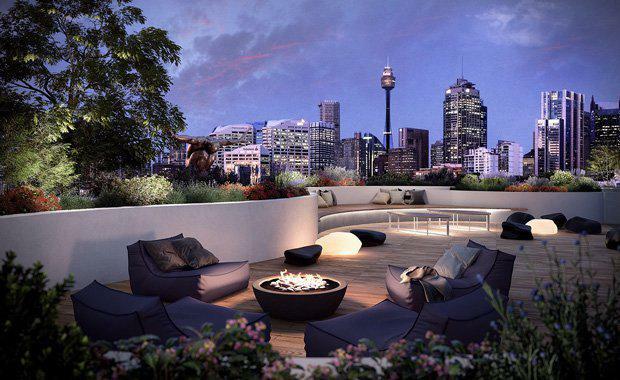 Launch details have been unveiled for the former Bushells Tea warehouse site on Harris Street in Sydney’s Ultimo, which is being redeveloped into a modern mixed-use development. New Life/Ultimo, a $300-Million development from Auswin TWT, will hasten the gentrification of this fringe CBD suburb. New Life/Ultimo is strategically located on an elevated 5,322sqm site at 495 Harris Street, opposite the Ian Thorpe Aquatic Centre and next to the Ultimo Community Centre, which contains a library, sports hall, craft room and a childcare facility. Five minutes walk away the 20-ha Darling Harbour is being transformed through new convention, exhibition and entertainment venues, a five-star hotel, an urban village and retail and commercial facilities. “Ultimo is well connected to light rail and bus services, and locations like this where you can do without a car, or at least leave your car at home during the working week, are becoming rarer,” said Ben Stewart of CBRE. Simon Platt of Kinsale Property Group said, “Ultimo is on the doorstep of the CBD and has all the attributes of being a property ‘hot spot’. The eye-pleasing, multi-layered New Life/Ultimo steps down from nine-storeys along Harris Street to six levels facing Bulwara Road. It has a total of 210 apartments ranging from studios to three-bedrooms, including two-level terraces with street level access. CBD corridor views start from level one for the east-facing apartments, and water views ‘splash in’ from level four. competition-winning design includes a large open air courtyard and a purpose-built pedestrian laneway running from Harris Street through to Bulwara Road, which will be enlivened with specially commissioned public artworks. Another important element is the creation of a number of ‘slots’ and walkways into the development that allow passers-by to see in, and residents to look out, and which brings light and sunshine into the courtyard. The architecture is a blend of traditional forms and modern detail, comprising contemporary elements and traditional craftsmanship. The lower levels of the building are brick to provide a solid look and feel in keeping with the former warehouses that once dotted Harris Street. By contrast, the upper levels seem to ‘float’ above the base – its linear form defined by metallic blade walls, silver-grey aluminium window frames and louvres, expanses of glass and recessed balconies.